Tips for getting the most out of your vanilla! At Rodelle, we produce high-quality vanilla extracts and other flavors that are a staple in baking recipes and we want to help you get the most out of the extract you buy and rely on! We’re compiling some of our best practices and little-known tips from experts to help you extend the performance of your baking ingredients, and get a little more bang for your buck. We know that when you buy Rodelle products, you’re trusting that the flavor and quality will enhance and complement the recipes that you hold dear, are excited to try for the first time, and will be made over and over again. It’s so fun for us to think of all the ways that you can use every product we make from our Gourmet Turkey Brine to our Pure Lemon Extract. Today, we’re focusing on vanilla products – our number 1 flavor!! We’ll do more posts throughout the year on our savory seasoning blends, baking extracts, brines and more! Vanilla is such a staple base flavor, therefore the quality of your vanilla extract or vanilla bean is key to a fragrant, warm, creamy end result for all your culinary endeavors. You can actually use Vanilla Extract in savory recipes to reduce levels of acidity! Vanilla extract gets its rich “vanilla” taste and aroma from vanillin, which is the primary flavor component of vanilla. Vanillin is a natural flavor component found in high-quality vanilla beans, the higher the vanillin, the better the quality. You can use Vanilla Extract, Vanilla Paste and Vanilla Beans interchangeably in your recipes: one teaspoon of extract = one teaspoon of vanilla paste = one vanilla bean. You do not need to refrigerate your extracts! In fact, the cold will cause a cloudy appearance and weaken the flavor over time. Look for Rodelle Vanilla Products your favorite grocery store and online for a continuous superior taste. When it comes to vanilla beans we are often asked how to properly use vanilla beans. You may hear the term “split and scrape” quite frequently. This is referring to the steps you take to open the vanilla bean pod and use the seeds inside. Take the vanilla bean “pod” and lay it flat on a cutting surface. Use a sharp knife (we recommend a paring knife) and slice the vanilla bean down the middle, lengthwise, creating two long halves. You can use one “split and scraped” vanilla bean in place of one teaspoon of vanilla extract in any recipe. How do I store Vanilla Products? What is the best way to store vanilla extract? What is the best way to store my gourmet vanilla beans? Vanilla beans are best when stored in a cool, dry and dark place. Keep vanilla beans away from heat and do not put into the refrigerator or freezer. After you have opened your beans, store them in a closed, airtight container such as a zip lock bag to keep them moist. Also store the opened vanilla beans in cool, dry and dark space. Rodelle’s vanilla extracts are certified kosher, gluten-free and contain no added sugars. What is the shelf life of Vanilla Extract and Vanilla Beans? What is the shelf life of my vanilla beans? When stored properly, two years. Do not refrigerate or freeze, even after opening. What is the nutritional information of Vanilla Extract? What is the nutritional information of Rodelle Vanilla Extract? 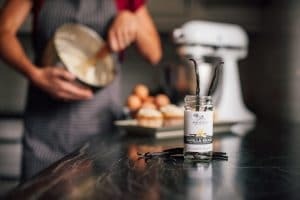 Vanilla extract has insignificant amounts of any nutrience when used at normal levels in cooking and baking; therefore it does not need to have a nutritional fact panel on the packaging. Since one teaspoon or tablespoon of vanilla extract is typically added to a recipe producing many servings, very little vanilla exists in each serving and the quantity of any nutrient added to the recipe is so small it cannot be calculated. Does Rodelle Vanilla Extract contain any allergens? Rodelle Vanilla Extract does not contain any form of milk, wheat (including all sources of gluten), soy, peanuts, tree nuts, eggs, shellfish, or fish. All Rodelle Vanilla Extract is run on an isolated line to prevent cross contamination. If you have more questions about how to get the most out of your vanilla extract, contact us!